Details relating to the Lithuanian Commemorative of 2015. This coin has been issued to honour the Lithuanian language. Lithuanian is one of the oldest (if not the oldest) living Indo Germanic language. The inner ring is filled the letters of the Lithuanian alphabet (32 in all). The word shown in large letters “AČIŪ” is Lithuanian for thank you. The country name “Lietuva” and the year of minting appear near the bottom of the inner circle and the mint mark appears at four o’clock. 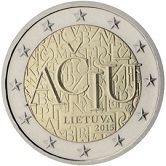 From Lithuanian Commemorative 2015 to euro coin collector.